March 25, 2016: An article in this week’s New York Times on Marshallese navigation techniques has gone viral and the link is being scattered electronically around the world, giving thousands upon thousands of people the chance to read about an ocean-going voyage in a canoe from Majuro to Aur that was achieved in June last year. The must-read story is written by Kim Tingley, who, with a number of scientists, joined the voyage of the Waan Aelon in Majel (Canoes of the Marshall Islands, WAM) canoe to Aur on the project’s chase vessel. Crewing alongside Alson on the voyage was Bilton Daniel, Sear Helios, Elmi Juonraan, Ejnar Aerok and Jason Ralpho. It had been hoped that master navigator Captain Korent Joel would be the canoe’s captain, but he was too sick to make the passage. 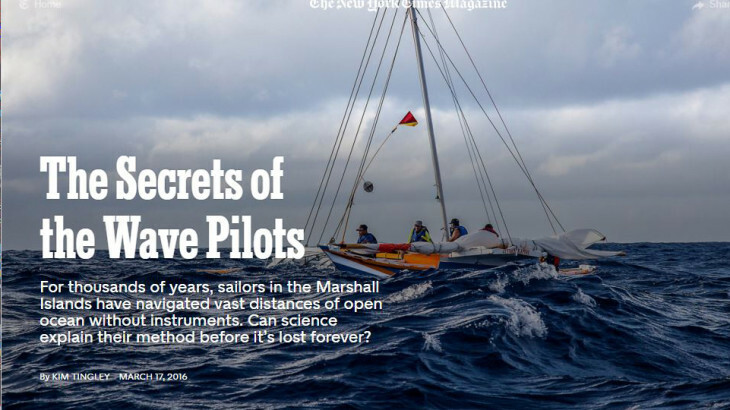 To read the article and view thel photographs, you can google the key words New York Times Marshall Islands in the News section or type in the following link: http://www.nytimes.com/2016/03/20/magazine/the-secrets-of-the-wave-pilots.html.